Dancers are some of my favorite photographic subjects. Having attended the High School for the Performing and Visual Arts in Houston, Texas, I gained an appreciation for dancers early in life. You could always tell the dancers in school by the way they carried themselves when they walked into a room. I recently had the privilege of photographing Jewellianna. She needed some images for an upcoming audition, so I set up an impromptu studio space in my family room using a large roll of grey seamless paper. I used a 2400 Watt/second Speedotron pack and two heads. I set one up in a 5' octobank softbox with a grid camera left to serve as the main light. On the other head I used a small 7" reflector and a narrow grid placed camera right, behind the subject, to serve as an edge light (notice the side of her head and neck). I also used a Nikon SB-600 speedlight, camera right, near the camera to serve as fill. Both the Nikon Speedlight and the Speedotron pack were triggered wirelessly via PocketWizards. See other images of dancers on this blog. What you see here is an image of my daughter from our recent photo session. You can see the first image here. We took a different approach in shooting this one. Instead of having her progress directly from right to left ending with a rear curtain sync flash pop, we had her twirl around and I manually popped the flash at a moment of my choosing. I then let the exposure continue a bit to fill in the frame some more. What are your thoughts? Is this kind of photography too "out there" for your tastes? Which image do you prefer? Why? Studio shot of my daughter moving across the frame. I had a lot of fun collaborating with her on this shot. Click on the image for a larger version. Setup info: 4’ softbox with grid (to control the spread of the light) to the left of the model. Hot light about 20’ to the right of the frame. 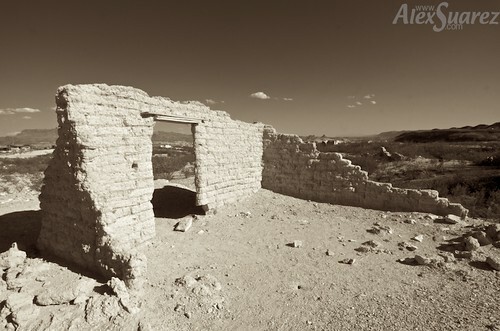 Ruins in Terlingua Ghost Town.